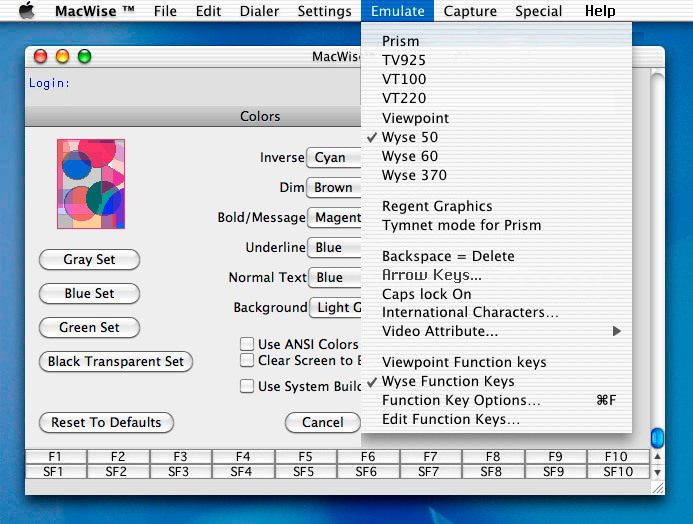 MacWise began it's life as a Prism terminal emulator for Apple IIGS in 1988. But the name was originally not MacWise. It was PrismGS and was not yet a released product. I wrote PrismGS using the AC/Basic programming language back in 1988 for my own personal use. The timeline below shows the progression of my terminal emulators from PrismGS to MacToPic to MacToPic Plus to MacWise. There were many incremental versions in addition to what is shown here but these are the major releases. Thousands of hours of programming over a 30-year time span eventually added up to over 60,000 lines of code in MacWise version 16. Worked on this version for about a year in preparation for a consumer product. Macs ran on 68000 series processors at this time. ( I discovered that another developer was already using the MacPrism name and therefore needed to change my app name). This was the first product for sale. The name, MacToPic alluded to the fact that it let Macs communicate with host computers running the PICK operating system. This was before the internet and MacToPic was shipped by mail with 3.5 inch floppies and a printed manual. This released version also used the MacToPicFont which I designed myself one pixel at a time using a program called Fontastic. This was necessary to support graphic drawing characters which use character fonts to display single and double lines for drawing boxes. This font was later renamed to MacWiseFont. This first version of MacToPic Plus was built upon MacToPic version 2.52 and added the capability to display MacPaint Pictures under host control. This photo of the box, manual and floppy disks shows the packaging for the product. It was the same packaging that was used for the original MacToPic in 1989 but added stickers showing that it was the plus version. Before the Internet, everything was mailed out by US Postage. We used Pagemaker to create our newsletters. and mentions the new Powerbook 170, a PROC for transferring data and our award nomination. Microsoft discontinued QuickBasic for Mac. This was a huge project, taking months, with much of the code requiring a rewrite. The CommToolBox was a major addition requiring months of programming. I created the Carnation Software web site using a text editor and html code. Started selling MacToPic and MacToPic Plus on the web. This was initially based upon MacToPic version 6 with no Host-To-Mac and Mac-To-Host data transfers. Also, did not support special host commands yet or Applescript. Another huge project to add AppleScript commands for the user to interact with the host and other Mac applications. Now uses the Mac unix shell to make all connections to the host. Added option to lock settings files for corporate users. Added text data transfer (Host-To-Mac and Mac-To-Host) ported from MacToPic program. Added Special Host Commands ported from MacToPic program. Telnet and SSH Connections added. Runs natively on Intel and PPC Macs. No more Rosetta. This was accomplished by converting the entire MacWise project from Basic to C using FBtoC. This was another huge programming project requiring many months of work. All pull down menus and dialog boxes are now in French when the French keyboard has been selected in in the OSX keyboard preferences. A lot of programming time went into this. A fellow FutureBasic programmer, Alain Pastor, did all of the translations from English to French. Apple no longer includes Telnet with High Sierra. You must use Kermit with MacWise to get a telnet connection. A Kermit installer is now included with MacWise. Apple stopped supporting bitmapped fonts in the Fonts folder. MacWise now uses internal bitmapped fonts from it's own resource folder.